It is time for shiny things and sparkly bits from Baroness X! On the menu for today is 2/3 of the newest bubbly set...and good news, it's blue! 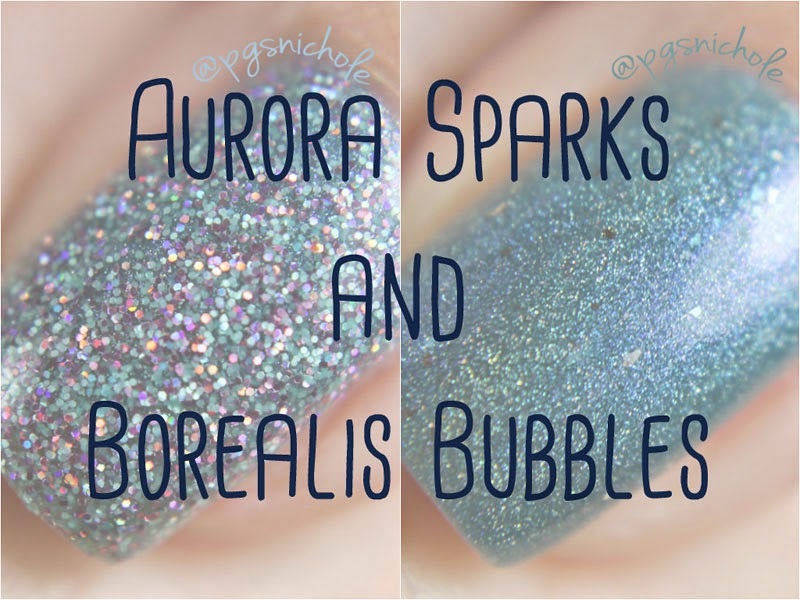 Aurora Sparks is a lovely aqua holo with sterling flakes. This one has a slightly more jelly-ish formula, and I only needed two moderate coats for the pictures below. I love this color. I love the finish. The linear flare is a little softer in Aurora than most of the other holos from Baroness X, but the color is such a stunner that I feel like this is appropriate. If the holo were stronger, the brightness of the blue would be muted...and that would be bad. Borealis Bubbles is a glitter topper packed with white, holo, fuchsia, blue, awesome, and silver tiny bits. I found it to be identical formula-wise to both Love Bubbles and Bumble's Bounce. I think this one is my favorite of the three, though. There is something about the combo of fuchsia and aqua that makes my heart sing. I used just two thin coats on three of my nails, with Aurora Sparks as the undies...and then because science I tried three coats over nothing on my ring. This polish could definitely be worn alone if you wanted. But when worn over Aurora Sparks, it reminds me of gems under water. As a Goonies fan, the hint of treasure buried beneath the sea makes me a little goofy. Ok, so before I wrap up here I need to talk about how awesome the new minis are. They are 8ml...but they take a normal sized brush! Instead of being short and stout, they are tall and narrow cylinders of comfortable painting. You may not realize it, but I actually have pretty large hands. Most minis are so small that they are really awkward for me to maneuver, especially with the awesome carpal tunnel syndrome I'm enjoying in my right hand. They will only be available when new sets are released, and only in limited numbers. They will also be without the decorative cabachon that the full sized bottles have...but I don't even care. They are fabulous to use and comfortable to pose with. I hope more makers adopt this size. There is one more polish in this set, which means this is a trio! Good things always come in threes! Check back tomorrow, and I will have the most wonderful color to share. Spoiler: It is the polish of Pusheen Aficionados everywhere.